You'll find a nice selection of stamped cross stitch kits for baby in the Embroidery Kits section of the store. 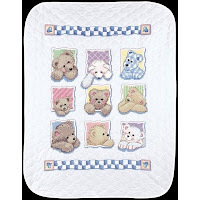 Our newest addition is the Bears for Baby Stamped Embroidery Quilt Kit from the Dimensions Baby Hugs collection. Soft pastel colors are used to create these adorable bears. Each of the 9 bears has it's own unique pose and personality! 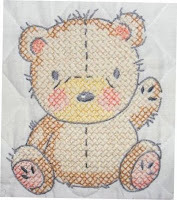 These stamped embroidery kits include a pre-finished poly/cotton baby quilt, cotton embroidery floss, needle, and instructions. 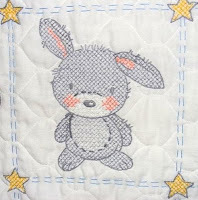 The design is pre-stamped on the quilt and ready for you to embroider. Make sure to see the matching Bears for Baby Stamped Baby Bibs Kit. If you're new to stamped cross stitch, you may want to give baby bibs a try. The small size makes them an ideal embroidery starter kit for beginners. Your kit will include 2 pre-finished bibs, floss, needle, and instructions. You'll need to have an embroidery hoop and scissors on hand to complete your embroidery project. Your finished bibs will be a thoughtful handmade gift for baby! 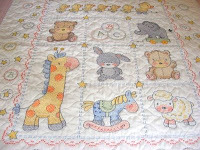 Cecilia Gutierrez-Victory purchased the Lullaby Friends Stamped Cross Stitch Kit at Weekend Kits and sent me photos of her finished baby quilt. You can see that Cecilia is a very talented embroiderer! Her fine detailed needle work is exceptional. The result is a beautiful keepsake quilt that will be enjoyed throughout the years. It truly is a work of art! My thanks to Cecilia for sharing her project. If you've finished one of our kits, we'd love to share it here! Visit the Contact Us page at Weekend Kits to send in your photos. There are 3 new beginner embroidery kits in the Kid's Craft Kits section of the store. These complete embroidery kits include everything you need to complete the embroidery project. Each kit includes three stamped embroidery designs, an embroidery hoop, floss, needle, and instructions. 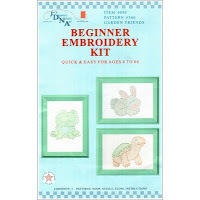 Beginner embroidery kits are ideal for teaching beginners and children 8 years and above how to embroider. Kids will learn a basic running stitch and use it to embroider the pre-stamped designs. When embroidering is complete, an optional finishing step includes using crayons to color in the designs as shown on the cover. Your child's embroidery work will be ready to be framed! This kit is also available in Outdoor Fun and Huggable Animals themed pattern collections. Learning new skills builds confidence and beginner kits make it so easy to get started! Explore a variety of creative craft categories at Weekend Kits and be ready to start a new project on your next Weekend at Home.